Walter Elias Disney (1901-1966) was an American producer, director, screenwriter, voice actor (… and so many things else!) 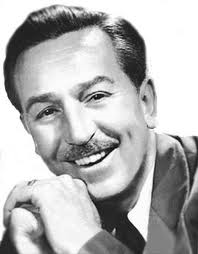 He became an icon because of the creation of Walt Disney Productions (now called The Walt Diney Company), with his brother Roy O. Disney in 1923. It is today a multinational mass media corporation based in California, USA. It is the biggest media in terms of revenue, with approximately 36 billion dollars in 2010 and the best-known studio. One of the most famous creations is Mickey Mouse which is the mascot of the Walt Disney Company. Disney influenced the entertainment all along the XXth century. In fact, Disney had been passionate about cartoons since his teenage years. After World War I, he began his artistic career. He found a temporary job in Pesmen-Rubin Art Studio where he met the cartoonist Ubbe Iwerks. Together, they decided to create their own company. Then, he became interested in animation and undertook to open his own animation business. Then, he created “Alice Comedies” and went to Hollywood to find a distributor. The series ended in 1927 but at the same period, the new series “Oslwald the Lucky Rabbit” was produced by Universal Pictures. The character became instantaneously popular ! One year after, Disney created his most famous character : Mickey Mouse ! Mickey is a funny cartoon character. Today (the cartoon was in black and white when it was created), he wears red shorts, large yellow shoes and white gloves. He is one of the most recognizable cartoon character in the world. An employee said “Ub designed Mickey’s physical appearence, but Walt gave him a soul”. In 1934, Disney began planning a full-length feature. In fact, another cartoon series “Popeye the Sailor” was more popular than Mickey Mouse ! That’s how W. Disney decided to make an animated feature-length version of “Snow White and the Seven Dwarfs”. The film came out in 1938, became the most successful motion picture of the year and earned over $8 million on its initial release. Then began the Golden Age of Animation. Disnet created ‘Pinocchio”, “Fantasia”, “Bambi” and then “Alice in Wonderland” and “Peter Pan” … He also found a family for Mickey : Donald Duck, Goofy and Pluto ! On a business trip to Chicago in the late-1940s,Disney drew sketches of his ideas for an amusement park where his employees would spend some time with their children. This plan was originally intended to be built on a plot located across the street to the south of the studio. These original ideas developed into a concept for a larger enterprise that would become Disneyland. Disney spent five years developing Disneyland. Herb Ryman had to create the first drawing of Disneyland and declared that once, Walt told him “Herbie, I just want it to look like nothing else in the world”. The park opened on July 17, 1955. Some celebrities came to see the Grand Opening, like Ronald Reagan for example. Walt disney began his speech with “To all who come to this happy place; welcome. Disneyland is your land.”. Nowadays, there are 5 Disneyland parks : one in California, one in Florida, another in Japan, one in Hong Kong and finally, one in Paris. Disney accompanied my childhood…such a wonderful company which has marked the cinema and will always stay a reference for everybody. Very good article !